Reflections on the rewards of "June-Uary" and the power of the Little Guy. It’s very difficult to forget that we live in one of the world’s great rainforest ecosystems here in western Washington – the Northern Temperate Rainforest. After all, with very little coaxing (just a few decades), the trees grow tall and dramatic, the mosses and ferns quickly drape the fallen debris, and – lest you need a reminder – it rains a lot. We are now in the midst of what my droll spouse likes to call “June-uary”, that nondescript but agonizing period from about May to mid-July when the rest of the country is bursting into spring and summer and we are just….drippy. With the damp comes hidden rewards. Walking the roads of our deeply forested neighborhood in Issaquah today in a typical drizzle, I happened to look down and see a Rainforest denizen: the Rough-Skinned Newt, Taricha granulosa. Very tiny, perhaps an inch and a half long, this little fellow was in the middle of the road and barely moving. In my usual silly way (I rescue worms too) I gently retrieved him and moved him to the forest florr on the roadside. 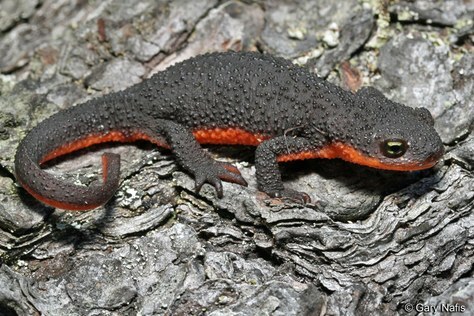 Yes, the Newt can induce paralysis and death. Just goes to show you should never underestimate the Little Guy.